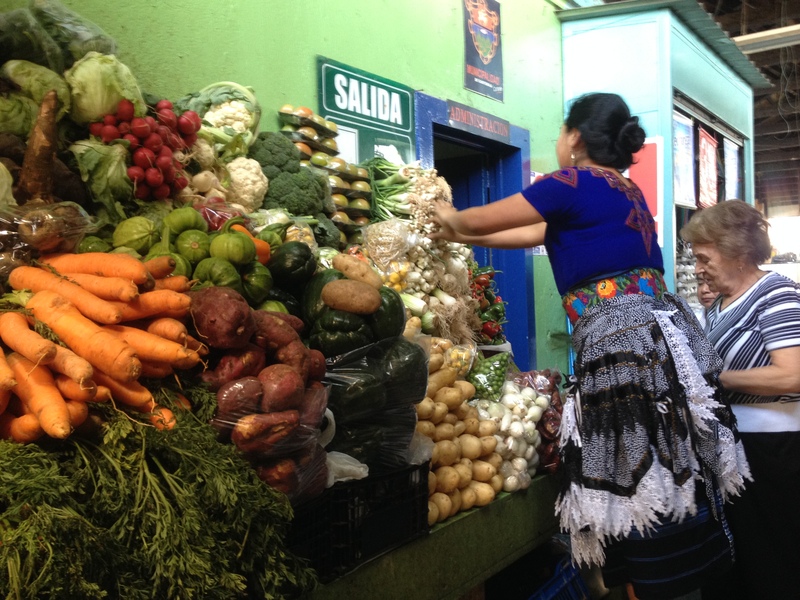 Entering a Guatemalan marketplace is like stepping through the gates to Narnia; you never know what sort of extraordinary journey will await you on the other side! The market outdoor displays consisted of vendors selling moss, flowers and twigs bound together to form the shape of reindeer and other festive creatures. As our grocery outing happened to fall on The Day of the Virgin, a small shrine was being displayed of a man bowing on bended knee to the Virgin Mary. The sound of a marimba echoed in our ears as the musicians displayed their talents for the amusement of on-lookers. Inside the market walls, fruits and veggies (many kinds that I was unable to identify), were piled almost to the ceiling. 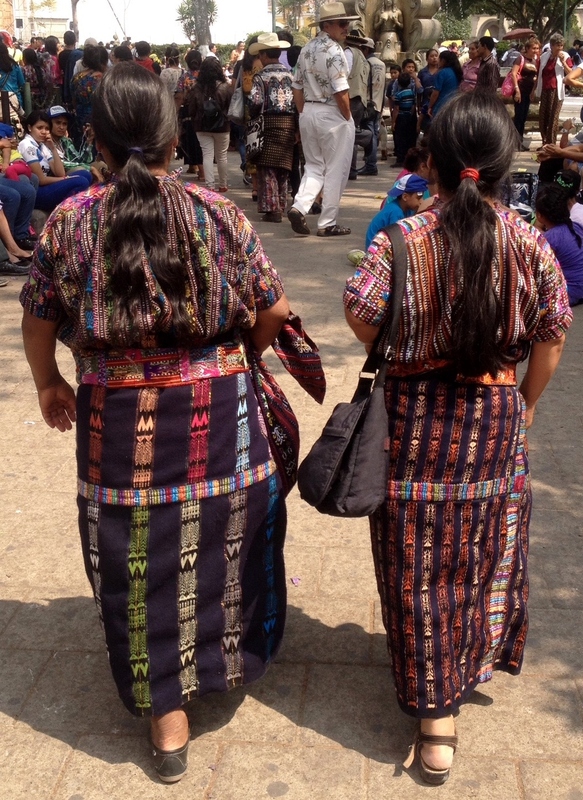 Guatemalan women, dressed in their vibrant coloured huipiles, stretched their bodies high to reach the vegetable mountain peaks. Karina’s grandmother lead the pack and I wandered closely behind with my mouth agape, all my senses stimulated. Bright flashing Christmas lights decorated each vendor’s station in honour of the Virgin. Santa Clause and Rudolph adorned signs which quoted excerpts from the bible written in Spanish. Clouds of delicious smelling smoke emerged from grilled meats cooking over charcoal barbeques. Car exhaust seeped into the building from the chicken buses passing by on the street, leaving me feeling a little light headed. Children ran up and down between the stalls stopping to ask us for spare change. They continued to stare at us long after we’ve turned them down. Karina’s grandma eventually gave in and purchased a set of five, hand-made wooden spoons from a filthy-faced little boy. He couldn’t have been more than 8 years old. A little boy dressed head to toe in typical Mayan clothing ran past me wearing a pirate hat and a patch over one eye. As he jumped into his mother’s arms she looked up at me with a big, bright smile. Her teeth were adorned with gold fillings. Teen-aged girls jostled passed the pirates while balancing enormous baskets with tropical fruits and banana leaves. A huge pile of batter made from corn flour was being scooped up by women making stacks of fresh tortillas at lightning speeds. Men and women worked hard preparing rice, potatoes, meat and cream dishes for their customers. Women breast fed their infants with one hand while attending to toddlers with the other. Babies slept soundly strapped to their mothers’ back in a blanket-sling, surrounded by echoing voices, pots and pans clanging loudly. The sounds of businesses racing full speed ahead. As we gathered the heaps of fresh fruit we had purchased and wandered back to the car, I gave a discrete wave to the sawed-off shot-gun toting teen-aged security guard. Just your average day grocery shopping in Guatemala city.